Lyndell from Powderhounds.com -We recently asked Lyndell to outlines why she loves her Pure shell jacket and pants. At least when it came to deciding on which jacket to wear, life was a little easier because when I ski overseas I only pack shell jackets. Each day, I only had to decide on the sort of colour mood I was in! The Pure shell jackets were ideal because they’re lightweight and compact to pack in the luggage, so I could fit in more than one jacket. We were on the road for 8 weeks and I didn’t want to get bored wearing the same jacket everyday! Being light was also important for days when I was skinning up a mountain, because the shell jacket generally went into my day backpack. Every gram counted when I was trudging up the hill! However there were also a couple of brutal weather days in Central Hokkaido where it was dumping with snow and I needed to leave the shell jacket on whilst skinning to stay dry. I certainly wouldn’t have been able to do this with a padded thick ski jacket on. Powdering my nose in the Hokkaido backcountry. 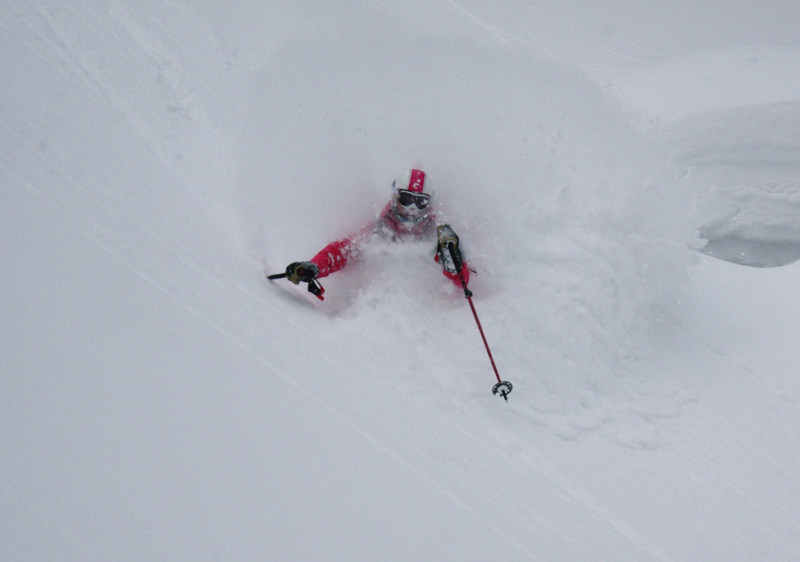 Getting in deep out cat skiing with Hokkaido Backcountry Club. All zips were definitely done up! Warming up in the snowcat with Top Dog. As I usually carried a backpack with avalanche safety gear most days, I also preferred wearing a shell jacket so that I could layer up and down depending on the temps, how strenuous the skiing or skinning was, whether I’d be sitting on a miserably cold chair lift or have protection from the elements in a nice gondola (or snowcat). Most days I just wore a couple of merino layers under my Pure shell jacket, but on a couple of super cold days, I added a down puffer jacket under my shell. Luckily the jacket has plenty of stretch, so the puffer fit no problems (I even had plenty of room to eat a massive katsu curry lunch!). Stormy day in Central Hokkaido where layering up was essential. In powder this deep it was great to have on the Eiger pants with the bib to ensure the powder stayed outside my clothing. It was so snowy in the Hokkaido backcountry that Top Dog needed the hood on. In addition to many very snowy days, we also scored a few amazing bluebird days. One day we went out heli skiing with Hokkaido Backcountry Club and there wasn’t a breath of wind or a cloud in the sky. This was definitely a day where I only needed one merino layer under the shell jacket and had the pits unzipped. A perfect weather day out heli skiing on Shiribetsu in Hokkaido. There was no need to layer up this day! Heli skiing on Shiribetsu. It was great wearing stretch fabric to make getting in and out of the helicopter easier. Not sure why the guide thought I wanted to hold his hand?! Hokkaido powder: even yummier than ramen and sushi. Another of my decisions each day was “which pants to wear” because I took two pairs of Pure pants with me to Japan; Eiger shell pants and an insulated pair - the 'Remarkables'. I could very happily have only worn shell pants because they were so functional and super comfortable, but I love the colour (Tropic) of my insulated pants. A fine day at Gala Yuzawa to wear the Remarkables insulated pants. The snow monsters at Zao Onsen weren’t so scary. Typically on fine weather days or those where we were mainly just riding inside the resort, I wore my 'Remarkables' insulated pants, whilst on storm riding days when there was powder flying everywhere, I loved wearing the Eiger shell pants because the overall bib ensured that I didn’t get powder in the wrong places. The Japan powder is fantastic but not when it’s down your pants! Warmth was never an issue with the shell pants because I usually wore some nice merino thermals underneath. Getting hot and turning into a sweaty mess was typically more my problem! On some days we’d do a bit of boot packing or put the skins on to chase some fresh powder. Being able to unzip the pant legs on the ascent was an absolute god send! Skinning away from one of the stinky fumaroles at Asahidake. Japanese food, the people, the cultural experiences, and most importantly the phenomenal powder – when can I go back to Japan?! Mt Yotei in the background on a beautifully fine day. Shiga Kogen: enjoying the views at Shiga Kogen. We met up with Ken who was clearly a fan of Pure too! Hard not to love some powder in the face! In search of the perfect powder stash? This website provides comprehensive information on powder skiing and a number of the best ski resorts in locations around the world including Japan, Canada, USA, Europe, New Zealand and South America.